November 13, 2010. Robyn and I biked with our friend Marita across Seattle to get our Undriver Licenses™ at a Liveable Streets event held at the University of Washington, with lots of groups tabling there, low-cost helmets, and more. We made a beeline for the Undriver Licensing™ station. We were greeted by Undriving™ founder Julia Field and her team of volunteers. Since we’ll be taping a conversation with Julia, I wanted Robyn to videotape me and others getting our Undriver Licenses™ for that show. Chelsea took the lead, explaining Undriving’s goal — to reduce car use, mine or others. I filled out a short pledge form for action’s I’d take in the next month. She urged me to do something that was doable but a stretch. Since I’ve already been doing many errands by bike instead of car, I had to dig a bit deeper. I pledged to get all our groceries by bike over the next month. Chelsea brought me to the next station to prepare for getting my photo taken. Paula said that, if I wanted, I could choose props to wear in my photo. They had a red boa, a crown, a soft red velvet hat, a toy bicycle and more. Okay, I gotta admit, the ham in me took over. I perched the crown on top of my bike helmet, wrapped the red boa around my neck, and held up the toy bike, grinning proudly at becoming an Undriver™. Sander snapped the picture, tweaked a bit on the computer and printed the license. Noting that it was issued from “Planet Earth” no less, I checked off which “Undorsements” I could sign up to (like walking or taking fewer car trips) and signed it. Sandra laminated my card, presenting it along with some free Metro (bus) passes, which we’ll use while here in Seattle. Being an Undriver™ — what a brilliant idea for having fun while raising awareness and doing something that matters for the planet. 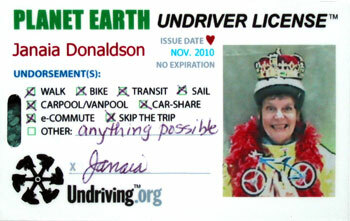 For a $20 donation you can send in your photo and get your Undriver License™. Now, isn’t that a cool idea for you and as a gift for others? Then you too can whip it out when they ask for your ID and start a conversation about driving less. Learn more at Undriving.org. Watch Undriving™ – Changing the Way We Think (episode 205). What a brave commitment to un-driving. I admire you greatly and want to salute your royal self. It encourages me to look at ways I can also reduce my driving habits, though my trudging into town (only about 4 blocks away) is quite different from your living situation. Just takes planning more time for walking and to not forget items so easily. Thanks for your courageous stand!